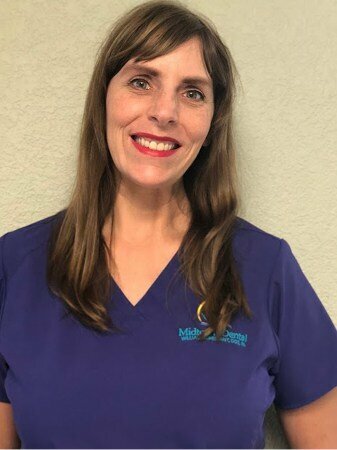 Kim has an associate’s in both dental hygiene and applied science from South Florida State College. She also earned a bachelor’s in communication from the University of Kentucky. She’s been working in dentistry for almost twenty years and has been with Midtown Dental for over a decade. She credits her own personal experience with dental health care for pushing her to pursue a career as a registered dental hygienist. She strives every day to give her patients the best experience that’s personal, professional, and always friendly. Kim says Midtown Dental is unique because of the team’s compassion and commitment to giving back with the annual Free Dental Day to people in need. Kim is competitive, disciplined, compassionate, fun, and spiritual. She enjoys spending time with her boyfriend and family, vacationing, caring for her animals, playing piano, exercising, helping the elderly, and doing yard work.